Started in 2005 by a group of enthusiasts and friends of over 30 years, and originally based in Orlando, Florida, the club's beginnings concentrated on searching out Artists, Producers, Musicians and anyone connected with creating the music that had been a backdrop to our lives. The name 'Hitsville' was chosen as a testament to the company founded in Detroit by Berry Gordy. Whilst the music enjoyed by the club has always primarily been 60s and 70s soul of all tempos, styles and the 45s played range from almost impossible to find rarities to dollar cheapies, the criteria being the quality of what's in the grooves. 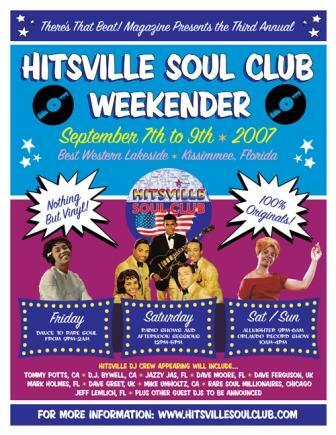 The first Hitsville Rare Soul Weekender took place at La Quinta Resort and Hotel in Kissimmee, Florida in 2005. Collectors from the US collaborated with their UK counterparts to create a weekend of rare soul played from original vintage vinyl. From these humble beginnings, with 40 participants, the club established itself as a collection of record enthusiasts intent on maintaining a close knit friendship based on our mutual love of soul music, vinyl records and the people who created them. Originally, the we ekender was planned as a one off but people had such a good time in Orlando in '05 that it was collectively decided to try and make it an annual gathering. 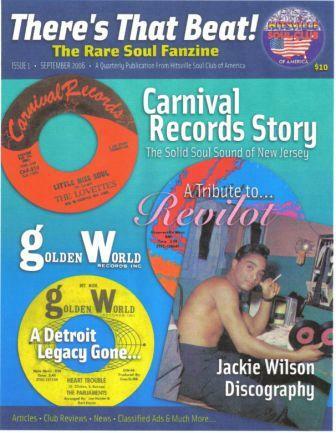 Hence the Hitsville Annual Rare Soul Weekender was born. In 2006, the club doubled in size and the 2nd Rare Soul Weekender hosted over 70 'dancin collectors' from both continents once again. Over the next 3 years all the research, digging and interviewing would make its way into the pages of 'There's That Beat! ', resulting in the stories of many little known contributors to soul music having their belated, but much deserved, 15 min utes of fame. All in full, glossy color, just as it should be. Collectors from all over the world contributed to the magazine that published 11 issues between '05 and '08 and our thanks go out to each and every one of them. The 3rd Annual Hitsville Rare Soul Weekender saw the club once again return to La Quinta which had now become a Best Western resort, with even more numbers and that year we proudly hosted a special trio of record guys from Philadelphia's golden age. The Harthon Record Company owners, Johnny Stiles, Luther Randolph and Weldon Arthur McDougal III were our esteemed guests for the weekend and it was a special thrill to see their reaction to the full hour of their music that opened the Saturday Night Allnighter. 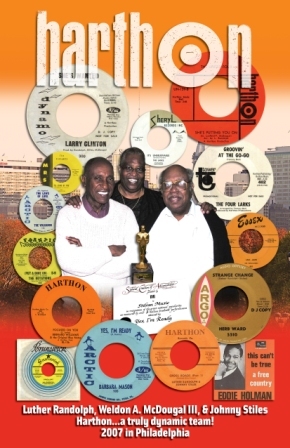 From that weekend in 2008, The Harthon Trio have all now passed away as has original Hitsviller Alan Pollard. I'm sure they sit and recollect the memories of that weekend now together. After 3 successful weekenders in the US, the organizers Bev and Dave Moore returned to Europe and settled in Southern Spain. The original members of the club decided to continue the Annual vinyl frivolities and the past 10 have taken place in the small town of Mojacar, in the Province Almeria in Spain. The event takes place in the Hotel Continental, right on the beach! The 14th Hitsville Rare Soul Weekender takes place 15 - 19 September 2018 and once again will see collectors from all over the world descend on the Hotel Continental in Mojacar, for 4 days and nights of vinyl mayhem. Over the years, the club has used ticket sales to purchase and maintained all its own sound rig and special care is taken to ensure that all the equipment is set up to ensure the best possible sound available, to match the great records that are played over the weekend. The Weekender programme begins on Thursday with an evening 'early arrivals' session at Lua Beach Bar and the Friday and Saturday events take place at the Hotel Continental. On Saturday we host a poolside soul session and on Sunday we host the now traditional Sunday Soul Alldayer including a BBQ brunch on the terrace of The Continental overlooking the beach and the Mediterranean which finished off at midnight with a raucus oldies set. As the club grows the list of DJ collectors who join us grows. Some well known, some not so well known, but all possess that special ethos that ensures they bring their passion, knowledge and of course their records in order to share a few days with like-minded people who don't take themselves too seriously but know how to have a great time! Each year, everyone that plays a 45 at the Event receives a commemorative slipmat, (see below), these slipmats have become very much sought after and are seen as a kinda 'Badge Of Honour'. they can't be purchased or replicated and are unique to that particular year's Event.